At the California Trail Interpretive Center, we love helping you learn more about the amazing men and women who founded and traveled the trail; people like Christopher “Kit” Carson. As far as American legends go, he’s one of the biggest. However, unlike people from many famous historical tall tales, his stories are true. 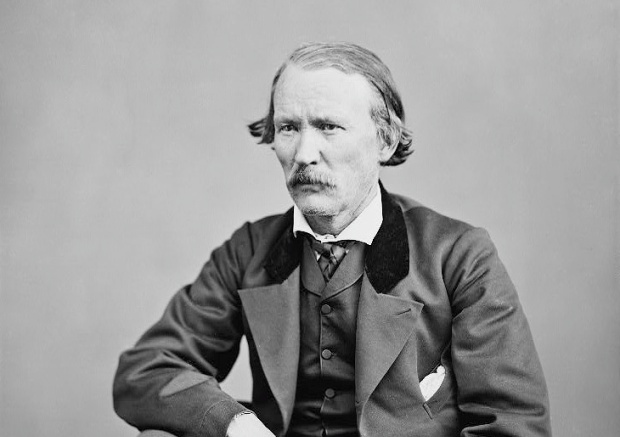 Kit Carson was born on December 24th, 1809 to Lindsey Carson and Rebecca Robinson Carson. His father was a veteran of the American Revolution but sadly died when Kit was only nine years old. His mother eventually remarried, but Kit did not get along with his stepfather and signed up with a merchant caravan traveling the Santa Fe trail at just 16 years old and started his adventurous life. Kit eventually became a noted fur trapper and explorer, often traveling between the rugged Sierra Nevada mountains and the towering Colorado Rockies. It was during this time between 1828 and 1840 that he met John C. Fremont. He led expeditions with Fremont that would lead to the founding of the California Trail and further cement his reputation as a first-rate mountain man. He apprenticed in a saddle shop at the age of 14. Kit served as a Guide for John C. Fremont. He once ran 30 miles to San Diego to get help during a battle. Kit led New Mexico volunteers during the Civil War. Carson married three times and had nine children. Visit the California Trail Interpretive Center in Elko, NV and learn more about the founding of the trail, its impact on westward expansion and the people who traveled its rugged path. Kit Carson is one of many fascinating people who made the journey across the United States or led others along the trail. Explore this vital piece of history for yourself and plan a visit today.